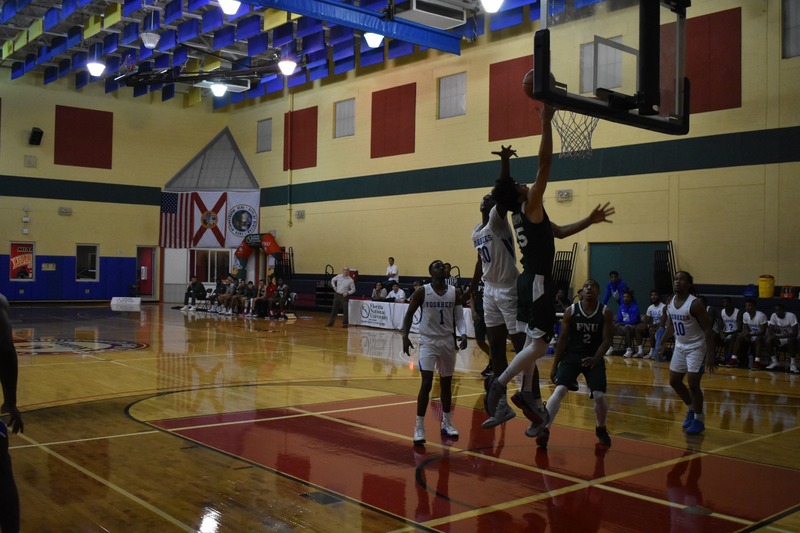 Hialeah, Fla. – Florida National University Men’s basketball team Beats Voorhees College on Wednesday night 97 x 89. At the beginning of the first period FNU and Voorhees College were pretty even, but Voorhees did a little bit better with more effective attacks and relentless defense and managed to pull away by 8 points at half time. Nico Rojas, led the team in the second half with 23 total points and twelve total rebounds to close the 8 points lead the tigers had. Antonio Sims added flashing scoring with 19 total points on 8-of-14 shooting. In overtime FNU opened 8-0 run in the beginning and kept the lead all the way to the final buzzer. Final: Florida National University 97, Voorhees College 89. FNU shot 54.8% from the field overall but was hot from the field in the second half, hitting 55.2%. Voorhees College hit 54.8% of its shots. Thomas Dillion led FNU with 10 points off the bench, going 4-of-7 from the field and 2-for-3 from Downtown. Nico Rojas led all scorers with 22 points and got 12 rebounds for his first Double-Double of the season. Antonio “TJ” Sims scored 19 points with 5 assists while Jeffrey Hernandez scored 18 points on 6-of-11 shooting with 4 rebounds. FNU Improved its record to 6-6 this season. FNU record at home was improved to 4 wins and 1 loss. 7 players saw at least five minutes of action for the Conquistadors. Florida National out-rebounded Voorhees College 35-25 in the contest. The Conquistadors will face Johnson University of Florida on Tuesday, November 27th, at Hialeah with a tip-off of 7:00 p.m.